A month ago, I had the chance to talk with multiple Latin Grammy winning artist Juanes, as part of my show “El Sitio con Ellen Flores” (The Spot with Ellen Flores) on La Kueva ch. 768 on SiriusXM and honestly, it was surreal. To be face to face interviewing the mind and voice behind so many compositions that have brought me so much happiness and have basically been the soundtrack my life was a moment I will NEVER forget. If you add onto that the fact that he is mad cool and passionate about music, it just makes it a million times better. In our conversation we touched upon his new project “Mis Planes son Amarte” which is an audiovisual project with 12 videos of 12 songs on the album. So far we’ve seen “Fuego” and “Hermosa Ingrata”; two very different and refreshing songs in contrast to his previous works. Each song a chapter in the visual concept portion of the album and now we reach chapter three with the latest single “Angel”. In “Angel” Juanes appears as the astronaut, trekking through a beautiful forest on a search. As he’s walking, a dog appears to help him- keep in mind this was the same dog that led him to the Shaman in the “Hermosa Ingrata” video- so now we know that this dog is a key player in the story. Astronaut Juanes then shows the medallion to the dog (the same medallion shown in the “Fuego” video) and now the dog helps him find what he’s looking for. The video shot by Cacho Lopez was done in a kaleidoscope and flashback style which gives us a parallel narrative between the astronaut and the Juanes we see in the two previous chapters. Shifting between sepia tones to bright, rich jewel tones in the forest, the astronaut continues searching until he finds a woman that walks out of the bushes. Once he finds her it’s clear that they know each other already because he splits in half the medallion, places one half on her neck and keeps the other half for himself. Did I mention the girl is the same as the girl in the photo he has in the “Fuego” video? Hmmm coincidence, I think not. As Juanes and the girl hold hands, time seems to warp in a dream like sequence that bursts with Juanes waking up from a surreal and very life like dream. But… was it all really a dream? I’m a HUGE Juanes fan (anyone that knows me can vouch for that) but in all honesty, I haven’t felt this much excitement or really loved a Juanes song so much so fast since his record breaking album “Mi Sangre.” When that album came out, I remember listening to it non-stop and falling in love with each story, with each song and the melodies in that album. For me, “Angel” gave me that feeling of excitement and anticipation for the entire “Mis Planes Son Amarte” album. 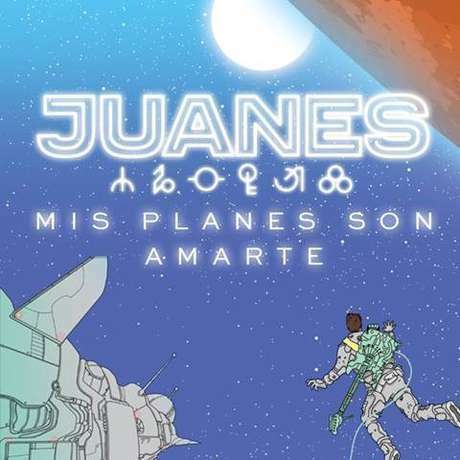 “Angel” is such a perfect Juanes sound that it sets the bar high in anticipation for the release of the 12 track album and also caters to my curious nature of wanting to find out what’s the deal with the astronaut, the girl and the necklace; was it a dream? Is he travelling through time? Is it a parallel universe? Who knows! For now, I’ll just hit repeat over and over again until we get the next chapter in this brilliant journey that is a wickedly fun ride Juanes it taking us all on! “El Sitio con Ellen Flores” airs on Friday at 3 pm ET on La Kueva (online ch. 768) and replays on Sunday at 10 am ET, Wednesday at 9 pm ET. For a free 30-day trial, check out http://www.siriusxm.com/freeTrial.